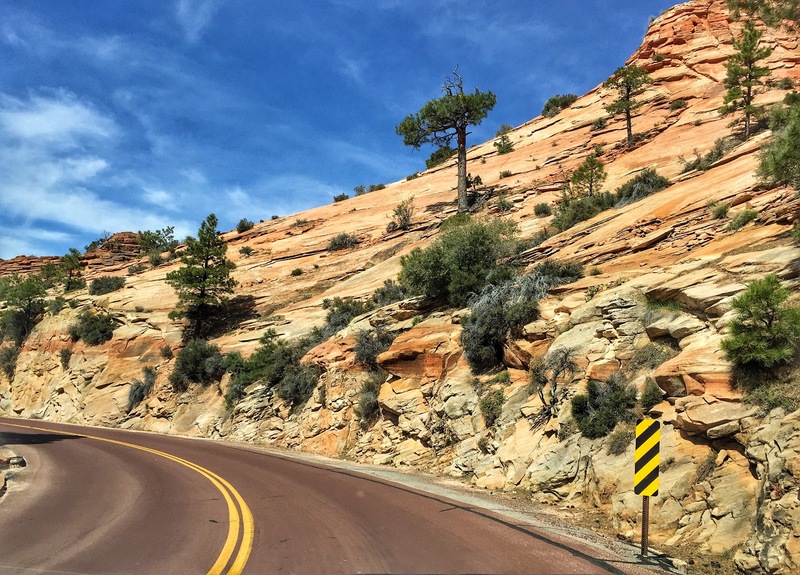 On Tuesday, we left our hotel at Bryce Canyon City, returning to Utah Highway 12 headed west. 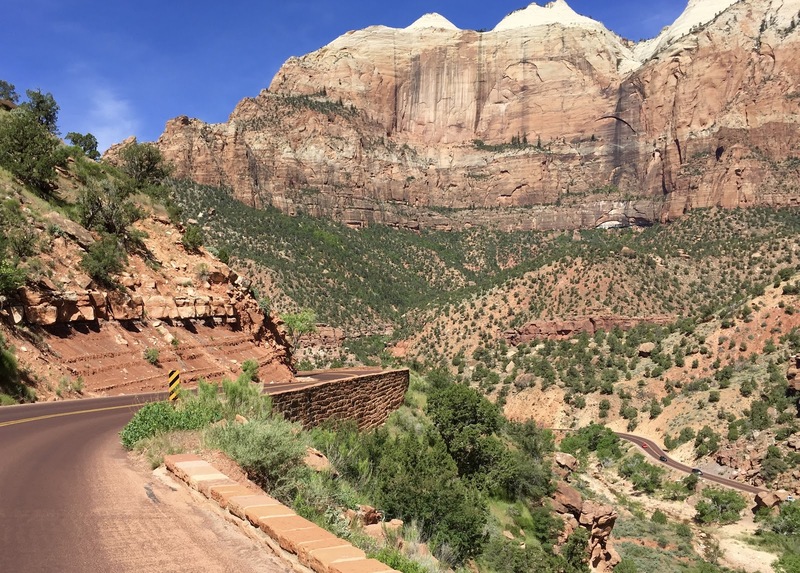 We were not to be on this famed highway for long as we turned south on US-89 toward Zion. 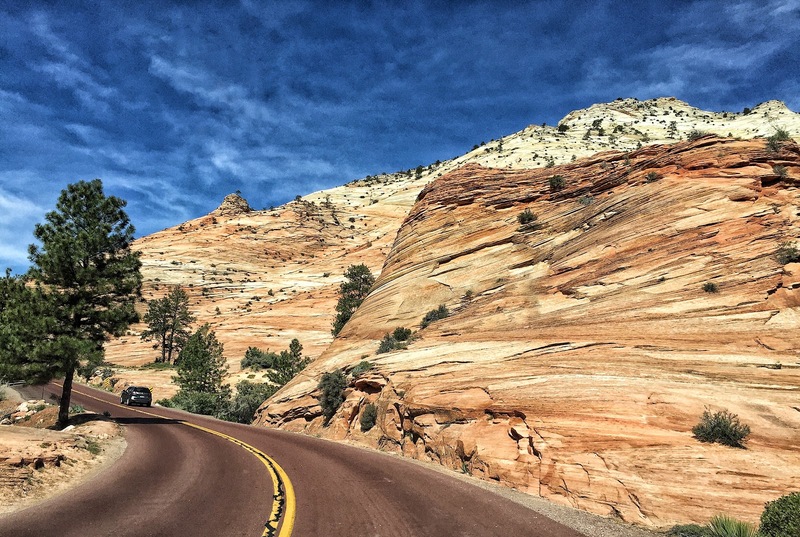 Scenery was pretty mundane—by Utah standards—until we turned west on Zion Mt. Carmel Road (aka Utah 9) in the little village of Mount Carmel. Our first hint of what Zion had in store was when we rounded a curve and found the massive face of the Checkerboard Mesa looming ahead. 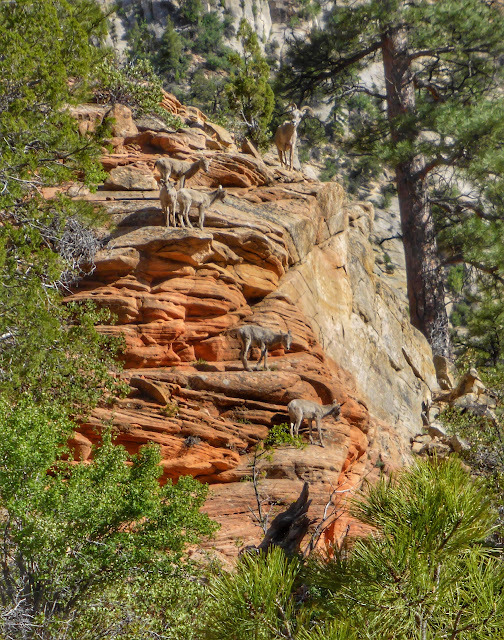 Its grid-like crack pattern leaves no doubt how this sandstone formation got its name. 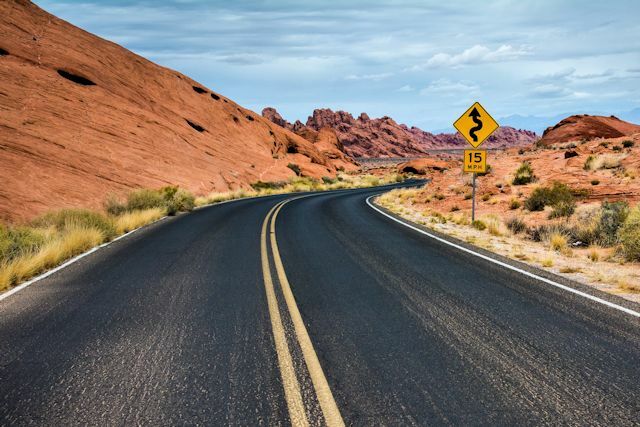 Highway 9 cuts right through the heart of the park, showcasing rock formations and unusual desert plants that Dr. Seuss would have been proud to call his creations. From swirling otherworldly stacks of sandstone to mounds and towers, hoodoos and hilltops, the red asphalt road leads visitors through a geological and biological spectacle. 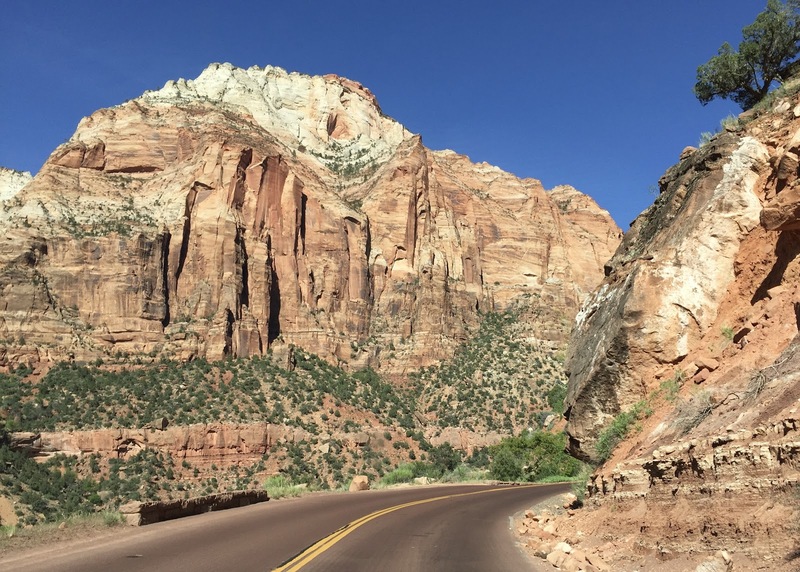 At the end of this breathtaking route, one reaches the historic Zion-Mt. Carmel Tunnel. 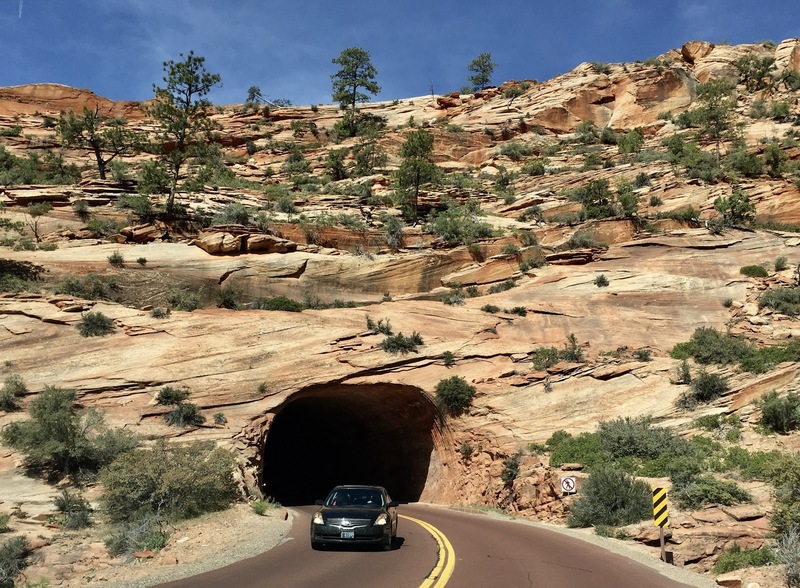 Built in the 1920s, the 1.1 mile tunnel shaved 75 miles off the trip between Zion and Bryce Canyon when it was completed. It is as narrow and low-ceilinged as you might expect of the time period, and currently vehicles traverse the tunnel in only one direction at a time. 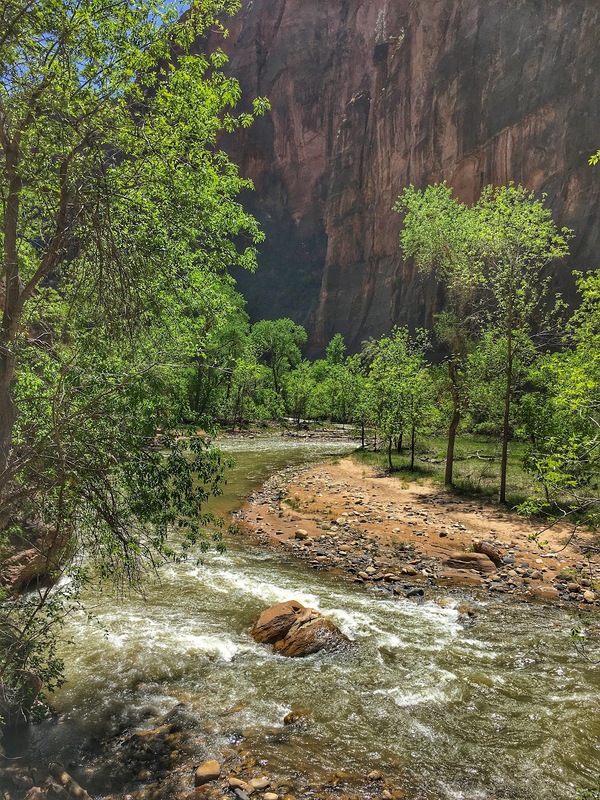 Upon exiting the tunnel, the road enters a series of seven switchbacks, zigzagging visitors from the tunnel down to the floor of Pine Creek Canyon, where you soon connect to the Zion Scenic Road. When the shuttle service is running (March to November), visitor vehicles are not permitted on the six-mile park road. But shuttles run every four to five minutes, so you never have to wait long for the next ride. Because of this, they weren't nearly as crowded as the Grand Canyon buses. Shuttle service also runs through the adjacent town of Springdale, where most visitors stay, to the visitor center, where you transfer to the bus for the scenic road through the park. Information about what features are near each shuttle stop is plentiful and convenient. Upon our arrival, we drove into Springdale, checked in at our hotel, and grabbed lunch at a nearby tavern. 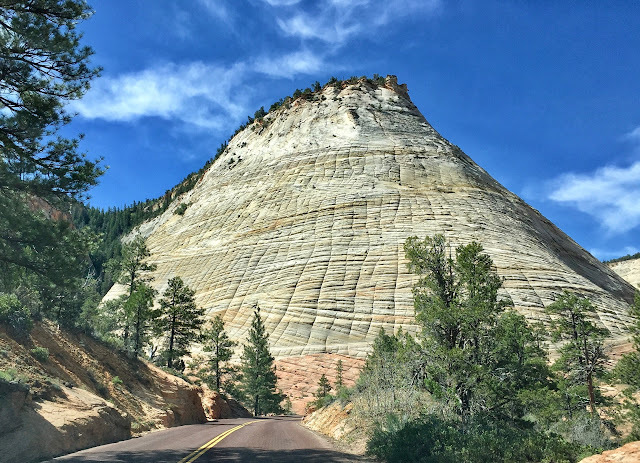 In contrast to the hackneyed cowboy/western vibe of Bryce Canyon City, we found Springdale to be a pristine little town whose attractive streets are lined with boutique hotels, chic shops and trendy restaurants. Somehow everything in the town looks fresh and new. After lunch, we caught the shuttle and rode to the Riverside Trail at the end of the park road. 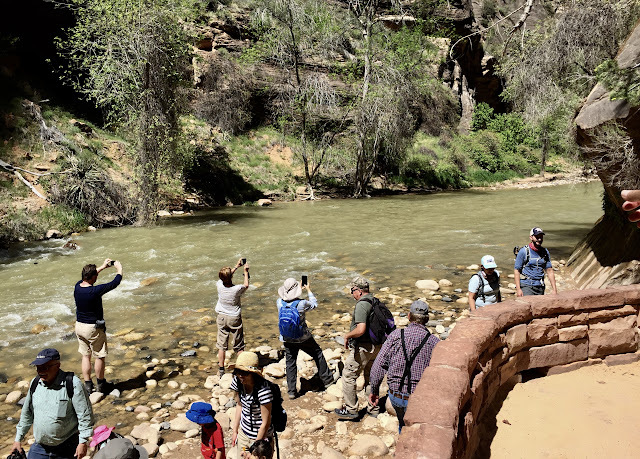 We were amazed and delighted to see how many visitors were hiking this 2.2-mile round trip paved trail which follows the floor of a narrow canyon along the Virgin River, the designer responsible for creating the magnificent terrain of the park. At the end of the hike, the Narrows Trail begins. 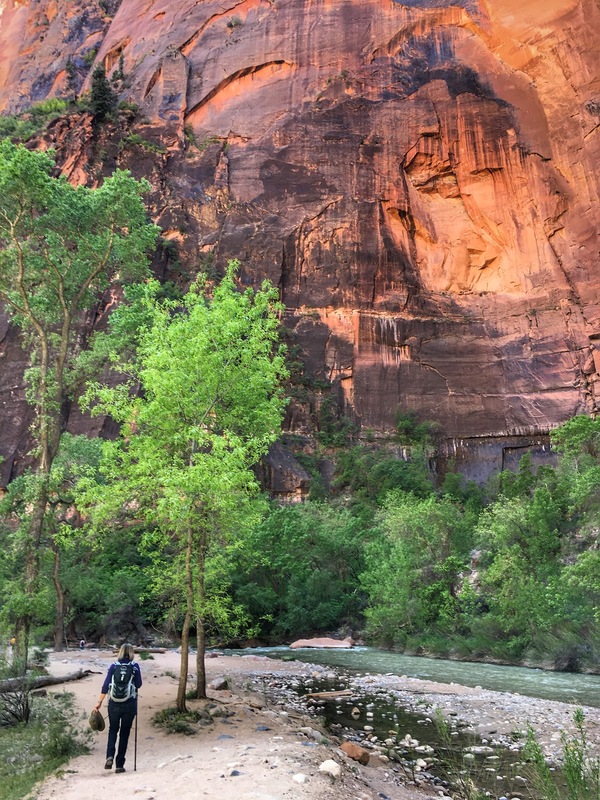 Zion National Park's most popular hike, the Narrows goes into the Virgin's slot canyon, which is often so narrow that hikers must wade through the river. Currently the hike is closed because spring run-off has the river too high and too fast for safe passage. Lots of visitors wanted to capture a photo of the famous "trail." 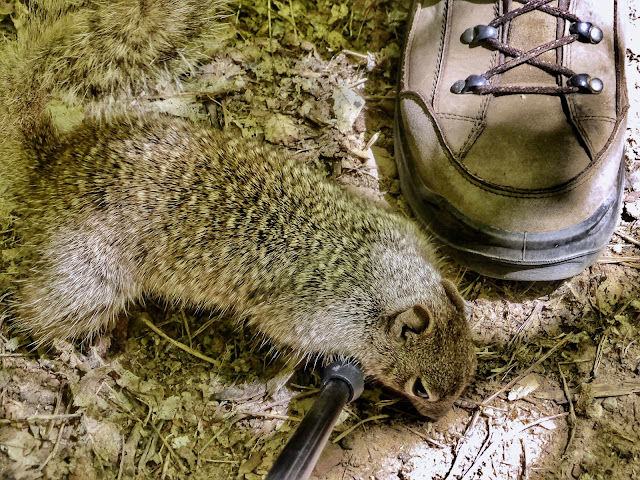 As we strolled along the Riverside Walk, gray rock squirrels often approached. We must have seen a total of 30 or more during the course of our hike. They are completely desensitized to humans and aggressive in their hunt for food, even snooping around unattended backpacks. 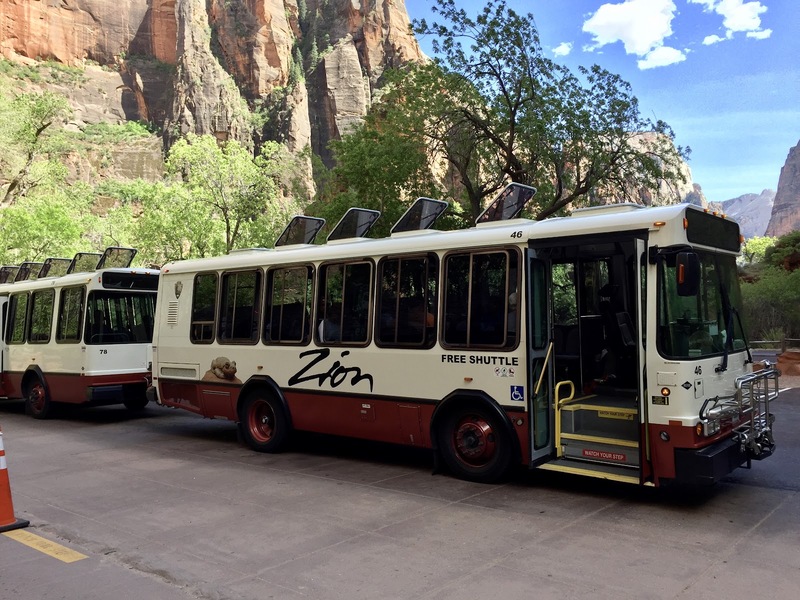 A banner on the back of Zion shuttle buses displays a human hand with numerous stitches to warn visitors that these ungrateful little rodents, cute as they may seem, are prone to bite the hand that feeds them. 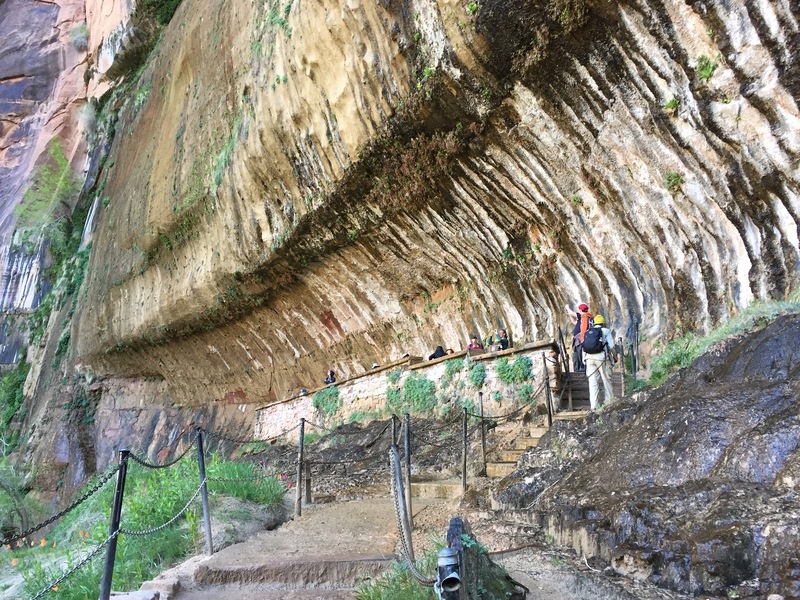 Our second day in the park began with the short but steep Weeping Rock Trail, a paved path which ends at a rock alcove with dripping springs and lush plant growth. 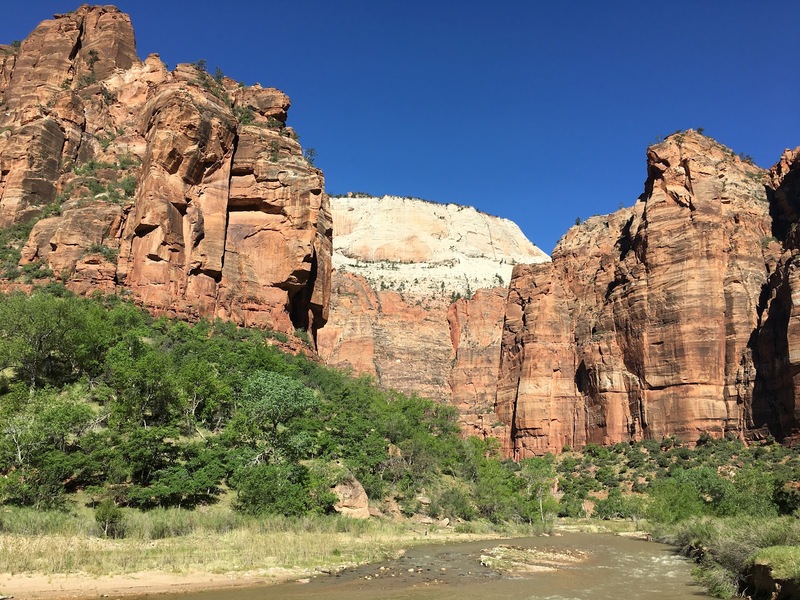 From there we hiked a section of the West Rim Trail that leads to the dramatic Angels Landing hike, which ends along a narrow ridge with steep drop-offs on either side. 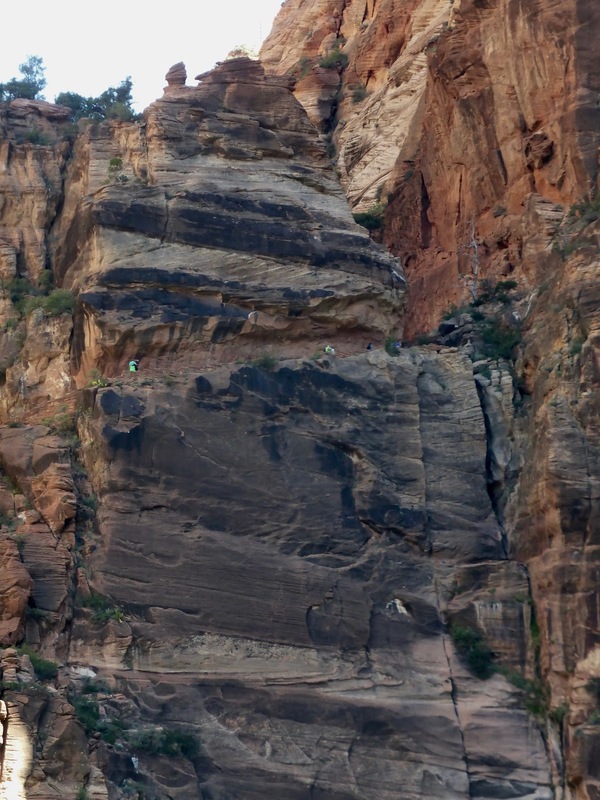 We had no intention of attempting that challenge but enjoyed chatting with people we met on the trail who had just finished it and were justifiably exhilarated by the achievement. 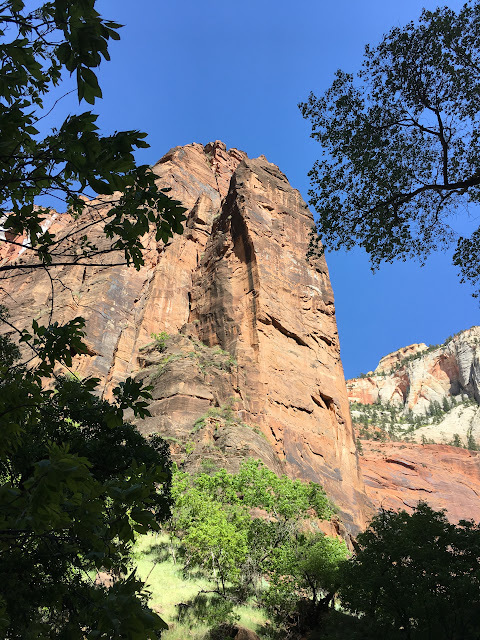 After a picnic lunch at one of the shuttle stops, we finished our park exploration for the day with the Lower Emerald Pool Trail. 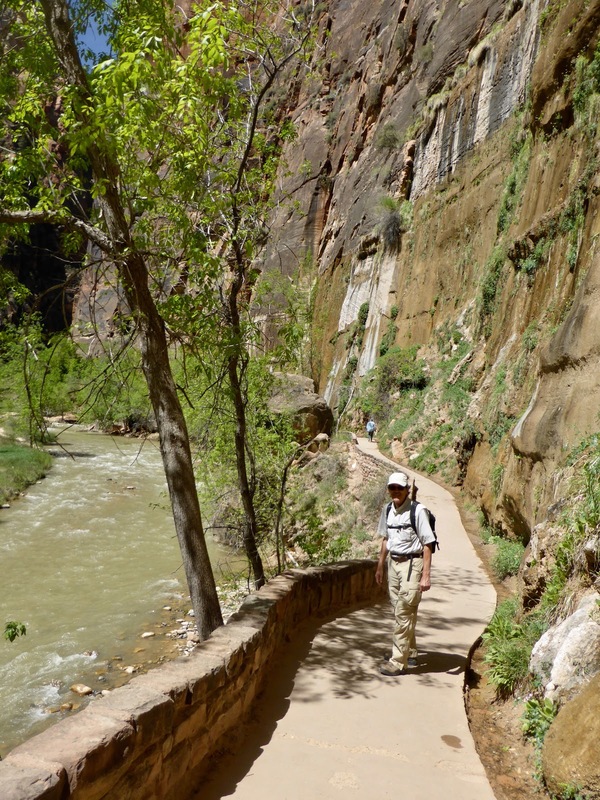 At 1.2 miles round trip, the hike is promoted as suitable for every age, and there were lots of seniors and children along the route. 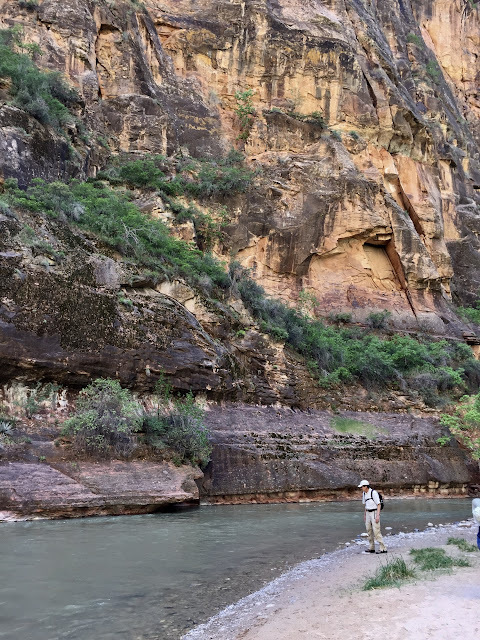 More than this paved trail, we enjoyed strolling along the river on established paths that weren't promoted as a specific hike. 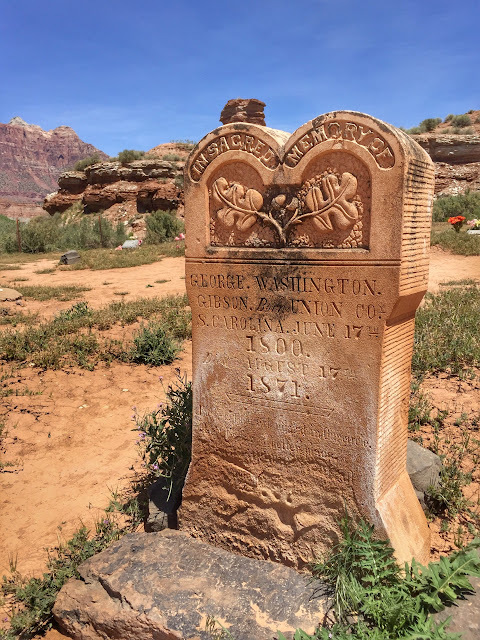 In the afternoon of our second day, we left the park to search for some letterboxes in nearby towns and—since we're in the West—ghost towns, finding a total of seven and seeing some interesting scenery outside the Zion confines. 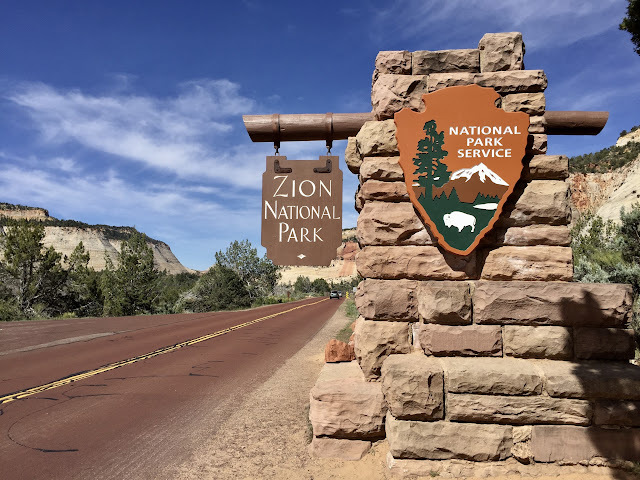 Tomorrow we'll leave Zion and drive US-89 to Page, Arizona to explore more of the southern Utah/northern Arizona wonderland of natural beauty. • 1909 President Taft declared the area Mukuntuweap National Monument. Loved: It was great to see the number and variety of people who were out hiking in the park. We saw hikers whose ages spanned from 2 to 82, and though they sometimes struggled a bit, all seemed proud of their hiking accomplishments. Lacking: Decent restrooms. The noxious odor of the pit toilets around the park could be smelled from 50 yards away. Somehow the Zion staff has allowed the restrooms to be overwhelmed by the increasing number of visitors. Similar facilities at Bryce Canyon had no unpleasant odor at all. Learned: We certainly learned why Zion is one of America's most popular national parks. 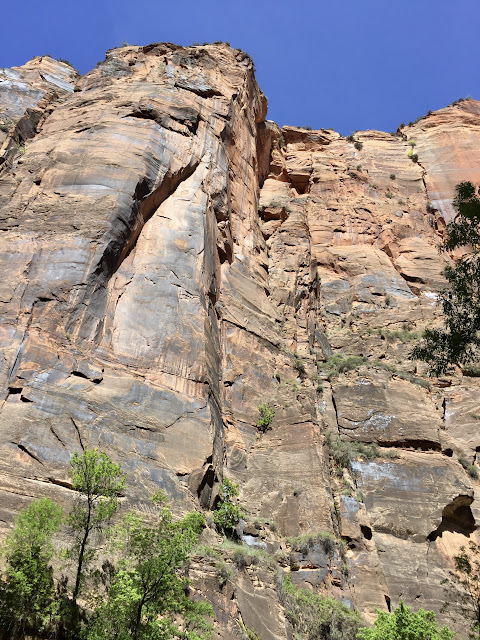 Gazing up massive sandstone cliffs to a brilliant blue sky and marveling at the infinite variety of shapes and colors and textures of its rock formations leaves no doubt that this unique spot exemplifies why we need national parks to protect such treasures. Tiny hikers scale the rock to Angels Landing up a series of switchbacks. Well-camouflaged longhorn sheep out for an evening stroll.